A lot of you may have never heard of the Taiga. The taiga is the largest expanse of forested terrain across the world. Filled with a hotbed of wildlife that ranges from the calm and docile to the aggressive and carnivorous. Bears have populated this land for centuries and roamed the vast lands that stretches across northern Russia and Canada. 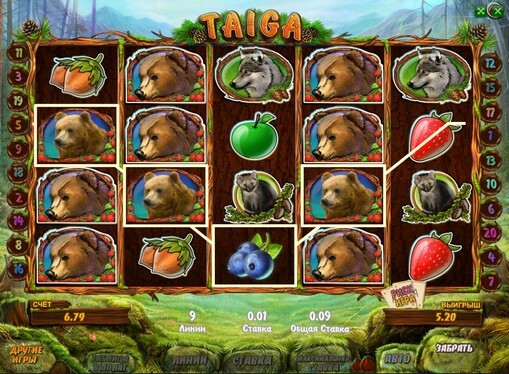 Nevertheless, this slots online game transports you to this natural world and allows you to hedge your bets on paylines filled with wild bears, penguins, and cunning foxes. Playson boasts an employment of over 250 staff worldwide as well as using highly advanced graphics and new technology to give their players the best! They offer their audience a range of diverse games with unique themes, as well as providing solutions for both online and land based gaming partners. They offer the best of both worlds by being creators and innovators as well as delivering excellent service to other casino developers! With one of their latest creations, Taiga, see for yourself the outstanding graphics and the kind of money you could be coming away with! Click here to see our promotions and learn more. Transport yourself to one of nature’s most beautiful settings in the world! 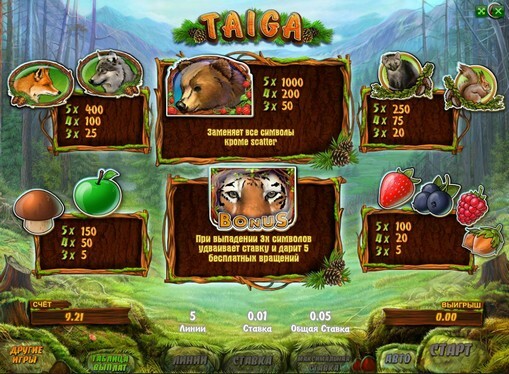 Taiga means forest in Russian and you will find these magnificent and vast landscapes covering most of Canada and Alaska and this is exactly where this slot-game appears to present itself, right in the heart of this settlement! Bear with as you encounter a range of different creatures that inhabit these woodlands, ranging from: squirrels, foxes, wolves, and tigers! Forage your way through nature’s finest fruits too as they will help you to accumulate several small rewards, which in turn, will turn into a small fortune, and maybe more! 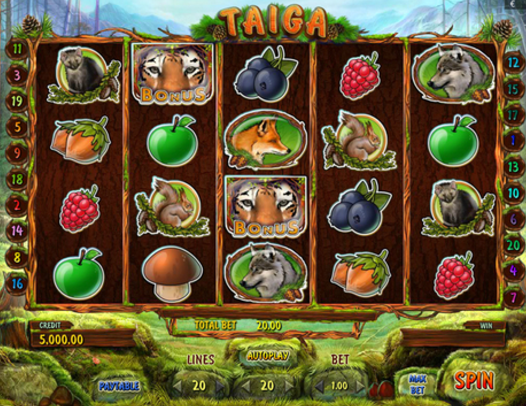 Bonus free spins and stacked wild symbols are also a part of this game! Find yourself discovering edible treats that only nature can take responsibility for, these include: apples, raspberries, strawberries, blueberries, acorns, and mushrooms. These will act as your normal value symbols where you typically need to match 3 or more of the same symbol to land yourself a cash prize. These symbols are also accompanied by wildlife, the kind of creatures you would expect to find in these woods and these include: foxes, wolves, pole-cats, and squirrels. However, these aren’t the only symbols to keep your eyes peeled out for, as there are two dangerous animals that are attempting to take territory over these vast plains of trees and mountains. One of these animals, the tiger, is the scatter symbol, and it will activate 5 free spins with a multiplier of x2 during these free games. The bear is the other dominant beast, and is the game’s wild symbol and as with any wild symbol, it will replace other symbols to help you accumulate a bigger win overall. With a minimum bet of just 1p and a max of £10, this slot-game allows you to win its maximum jackpot without breaking your own bank! With the highest value symbol being the bear, landing 5 in a row could land you with a x1000 multiplier. This is a massive increase from the other animal symbols as a x400 multiplier is given for 5 wolves or foxes, with a x200 for 5 polecats or squirrels. 5 mushrooms or apples will grant you with a x150 multiplier, and the rest of the fruit symbols pay up to x100 multiplier. With the variance of multipliers on offer, there is a great deal of entertainment to be had, not knowing the rewards that await you until you start to spin the reels! Don’t leave it all for the animals, what are they going to do with a jackpot prize of 20,000 credits? !